To Chelmsford on Monday evening, 24th October, for the formal launch of the Chelmsford Ideas Festival at the Anglia Ruskin University campus in the city, in the presence of Councillor Patricia Hughes – Mayor of Chelmsford. The assembled audience were warmly welcomed by Professor David Humber, Provost of Anglia Ruskin’s Chelmsford Campus, who went on to give a brief history of the University’s association with the Festival over the last five years. Professor Humber also gave us news of the development of new Life Science courses and infrastructure as well as the imminent plans to open a new Medical School on the campus in 2018. We learned from Prof. Humber that the city was host to some 93 events this Festival season, of which 20 events will take place on the University campus. In response the Festival Chair, Malcolm Noble FRSA, spoke in thanks for the contribution the city makes to the Ideas Festival and how the city’s support, made manifest by the presence of Her Worship the Mayor, was most gratefully and vitally received each year. Malcolm spoke also of a change of inflection for the Festival programme this year, involving children and families directly and threading practical arts and community focused events through the programme. You can discover the Ideas Festival on-line here, and see how the original socio-cultural research, which triggered the creation of the Changing Chelmsford Festival team, has attempted to fill gaps in artistic provision and increase community engagement across the city and its hinterland. They have been successful without doubt. ‘Live Cinema performance with Cambridge Concert Orchestra to mark the centenary of the First World War Battle of the Somme: lasting from 1st July to 18th November 1916. We will use the acclaimed score by composer Laura Rossi as commissioned by the Imperial War Museum. Laura Rossi and the Imperial War Museum Senior Curator Dr. Tony Haggath will introduce the film‘. We were thinking about our Christmas plans already in our Partnership offices and realised we hadn’t made contact over a busy summer with our favourite charity, JDRF and their great fund-raising team. So to make amends we are broadcasting the ideal place for you to buy your 2016 Christmas cards and do a little good too. Buy early to avoid disappointment! Give a life-changing Christmas card this forthcoming festive season. BUY YOUR JDRF CHRISTMAS CARDS OR ‘VIRTUAL GIFTS’ HERE. ‘There are currently 400,000 people in the UK with type 1 diabetes, over 29,000 of them are children. We are committed to eradicating type 1 diabetes and its effects for everyone in the UK with type 1, and at risk of developing it’. Continuing our theme of ‘Northern Energy’, we were in Newcastle upon Tyne this week and, on Friday afternoon, took time to visit Seven Stories, the National Centre for Children’s Books. They have an important exhibition and research project into the donated archive of the writer Michael Morpurgo. Below is what we thought. ”Michael Morpurgo Exhibition 2 July 2016 – Sunday 2 July 2017, Newcastle UK. A Lifetime in Stories. Seven Stories, The National Centre for Children’s Books introduces an exclusive exhibition drawn directly from Michael Morpurgo’s extensive archive donated to Seven Stories in 2015”. Through one of our our sister projects, Books go Walkabout, an international delivery system to get authors, illustrators and poets, and their books, to corners of the world previously unreached, we have an abiding interest in children’s literature as you would expect. The Seven Stories Morpurgo exhibition is certainly about a fantastic canon of work dedicated to the young imagination. However, the research team have extracted illustrative and delightful insights into, and evidence of, the writing process, using the archive generously donated to the Centre by Michael Morpurgo in 2015. What the display and featured narrative does offer, in the broadest terms, is an insight into the creative process, the research and writing of a book, much of which in this Seven Stories gallery has taken place before the arrival and dominance of the word processor. Not only an exhibition in praise of the work of Michael Morpurgo, but an illustration in itself of what can be achieved with a simple notebook and a pen or pencil. The imagination does not need an elecrical socket and plug to thrive apparently! Michael Morpurgo was born in 1943, and his early life was beset by sadness and conflicting tensions. It was interesting to see the detail of Michael’s school, home life and reaction to his early experiences in the British Army. This thematic thread of war and militarism can be traced through the exhibition, as in Michael’s life. His mother’s grief at the loss of her brother in the Second World War was an equally powerful emotional driver for the writing. In 1962 Michael met his future wife Clare, and it was the summons home by his mother, with the pretence of an imaginary illness, that offered the opportunity for them to get married, against the prevailing condition that cadets of the Royal Military College Sandhurst must be single. A signal turning point in a creative life which solidified his pacifism, well evidenced and illustrated by this exhibition. His first short book, published in 1974, was It Never Rained, an interconnected narrative about five children. By 1999 Mopurgo was ready to publish Wombat Goes Walkabout, with wonderful illustrations by Christian Birmingham. A great story about digging holes and how a wombat can save the day. 1982 saw the release of War Horse, perhaps Mopurgo’s most famous creation. The exhibition offers the visitor a display of many of the notebooks, first drafts, corrections and re-typed double spaced manuscripts that drove the creation of this seminal work. This series of displays offers, we thought, a powerful illustration of how writing is both a physical and an intellectually layered process, but which requires a gritty determination to see the story through to the final end – publication. It is this revisiting and deterministic approach to his craft of writing that makes a Mopurgo novel so dramatic and engaging we suspect. Before the stage play, before the film…there was the novel. In the exhibition narrative Michael Morpurgo states that his engagement with a story ‘…can be measured by the size of his handwriting in his notebooks‘. The smaller the hand written text the more intensely the creative muse has gripped him that day. To an archivist this is vital in determining the writers emotional condition on any particular creative day. 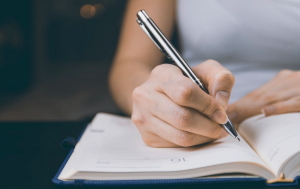 As his pen moves rapidly across the notebook page, Michael has left a marker, a measure of intensity, for later researchers seeking to determine his emotional or creative state. Something a plastic keyboard, no matter how powerful the micro-processor it is connected to, could ever offer the interested reader in years to come. Looking at the Morpurgo ‘war’ material, we pondered on what must be a pivotal issue for the contemporary archivist or researcher. With ready access to technology, publishing processes and cloud storage – how will future archivists and seekers of process engage with material that is electronic and resting, potentially, in a thousand different formats, storage facilities and locations around the globe. …a steady, ongoing rise in emotional valence, as in a rags-to-riches story such as Alice’s Adventures Underground by Lewis Carroll. A steady ongoing fall in emotional valence, as in a tragedy such as Romeo and Juliet. A fall then a rise, such as the man-in-a-hole story, discussed by Vonnegut. A rise then a fall, such as the Greek myth of Icarus. Rise-fall-rise, such as Cinderella. Fall-rise-fall, such as Oedipus. We are intense users of the notebook and pen ourselves, in our ordinary workaday lives, but have to recognise that research and analysis would now be immeasurably diminished without technology. We wondered, travelling through the Michael Morpurgo exhibition, an historical audit trail of the creative mind, what other contemporary children’s and young adult writers take on ‘techno’ is today? Towards the end of the exhibition content is a section dedicated to Michael Morpurgo’s artistic collaborators, the artists who have contributed to the written work. It offers the visitor a fascinating insight into how the imagination is populated by the story, how the psyche is suggested a character and landscape by Michael Morpurgo’s writing. It is also, within the context of this article, a soaring endorsement of the power and durability of putting a hand to paper. Surely no machine can replace the creative evocation of story by the artists below? The work on display includes artwork from Quentin Blake, Gary Blythe, Peter Bailey, Christian Brimingham and Tony Kerins amongst others. We particularly warmed to the diversity of images in the exhibition that depicted the sea. Whether Kensuke’s Kingdom or When the Wales Came, the original cover art to be seen provokes an imaginative dream of action, wind, water and a tale to be told. It was wonderful to see this collection of individual artistic work within the context of the Seven Stories Michael Morpurgo exhibition. But each artist has a separate body of work which is lively, imagination capturing and enchanting in equal measure. We hope you can use the links above to explore this on-line collection ‘gallery of galleries’ too. If you leave the impressive Newcastle Central Station and turn right down towards Quayside, you can turn left along Quayside and walk, past the Pitcher and Piano until you come to St. Ann’s Steps on the left. Ascend them. At the top, look back down the river to the bridges receding into the distance. Turn and cross the road and right down to Cut Bank on the left, following the river left along for a couple of hundred yards and Seven Stories will apppear on your right. The journey there, if the sun is shining, can be as uplifting as your visit to The National Centre for Children’s Books. This is a fascinating insight into the work of our national story teller. Seven Stories offers a whole rainbow of experience around ‘the children’s book’, whether a holidaying family looking to stimulate young imaginations, a visit to the cafe and bookshop, or a serious academic look at the sweep of children’s literature. ‘Seven Stories was able to support the acquisition from Michael Morpurgo through support from Heritage Lottery Fund’s ‘Collecting Cultures’ programme, which has been awarded to Seven Stories in recognition of the museum’s national role in telling a comprehensive story of modern British children’s literature’. The exhibition is delivered and developed through a new Knowledge Transfer Partnership (KTP) between Seven Stories and Newcastle University’s School of English Literature, Language and Linguistics. The KTP is possibly the first of its kind between a university English department and an external organisation, and is being funded by InnovateUK and the Arts & Humanities Research Council (AHRC). You can read Dr. Jessica Sage’s blog for more insights into her exploration of the archive here. Here at conversationsEAST we are delighted to be able to donate web hosting, design and content creation services and new media support to this new, nascent movement. Inequality in Education – turning the tide (IETT) is about change in the educational landscape and improving equality of opportunity and outcome for children and young people across England. The web site features not only regular news and featured ideas on the pages of The Tide, the IETT web journal, but also regular newsfeeds from a variety of sources across the education landscape. Monographia is a growing web resource of research papers and conference contributions that mark key themes for IETT groups. The Debate – filmed is a growing archive of videos that go to the nascent movement’s campaigning and research aims. If you have an interest in educational reform, or the social inequality agenda, we commend this site to you…Ed. Developing your project web presence? The conversationsEAST team are keen to offer web support to socially focused web projects in the East of England. We are particularly happy to support projects led by RSA Fellows, as our donating Partners at SmithMartin LLP, are keen supporters of the Society. We would also like to support the planned development of IETT groups in Nottingham and Oxford. See our project web offer at conversationsEAST here and contact us for more help, if we can. 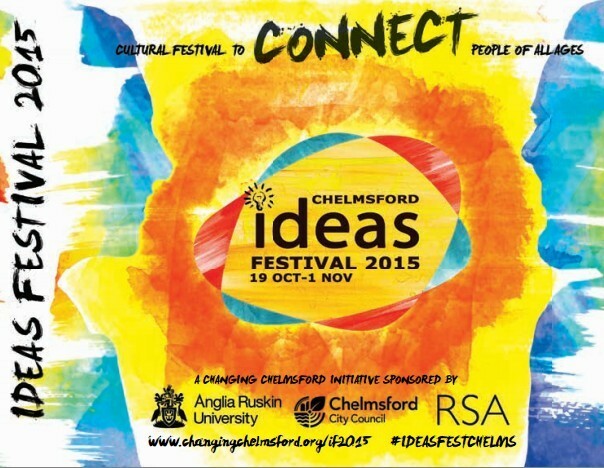 The Chelmsford Ideas Festival is almost upon us again this year. The programme of events continues to engage and stimulate Festival-goers across a wide range of cultural, artistic, heritage and innovation themes. The Chair of Changing Chelmsford Malcolm Noble and Ideas Festival Director Leonie Ramondt , and their teams, have put together a well designed and informative Festival programme – with the creative input of the Anglia Ruskin University Design Collective. (Thanks go to Jeff Bray, Becky Lockwood and Daniel Tubl). You can downoad a pdf copy of the programme here. Robotics…. Be part of world level engineering breakthroughs, achievements, and products being designed and developed in Chelmsford and Essex. You will have the opportunity to take control and get involved in various activities such as engineering design, 3D printing, using advanced computer models, robotics, aerodynamics, medical engineering, Raspberry Pi and many more. Learn about the change and impact that engineering in Chelmsford and Essex makes nationally and internationally. Essex Police is 175 years old this year. Nick Alston CBE was elected as the first Police and Crime Commissioner for Essex in 2012. He is currently Chair of the Board of the Association of Police and Crime Commissioners and Chair of the Police ICT Company Board. He will give us an overview of his experience as Commissioner, reflect on policing in Essex and provide some pointers on the police service of the future. A strong theme of the Festival this year is the notion of Creating the City of the Future. Ideas for city change, walks through the concept of change in Chelmsford and harnessing the power to create – a three part, multi-location event. Matthew Taylor of the RSA will be exploring the Power to Create the City, harnessing the thematic concepts enagaged in the Society’s Change Aims. Creativity is at the heart of innovation, enterprise and good places to live. But we are increasingly expected to be resourceful and self-reliant to shape our communities, with the help of amazing digital tools. The RSA says everyone has the power to create and to stival play a role in enlightened, active communities. Using the RSA ‘Change Aims’ we will look at the power to create the city with Matthew Taylor, head of the RSA. The conversationsEAST team will be at this event, mapping and reporting on this key Festival conceptual driver. Watch our web pages for a full report…Ed. See you in Chelmsford! See the full Festival programme on-line here.